BEST GASTRO PUB IN LOUTH FOR THE SECOND YEAR RUNNING! 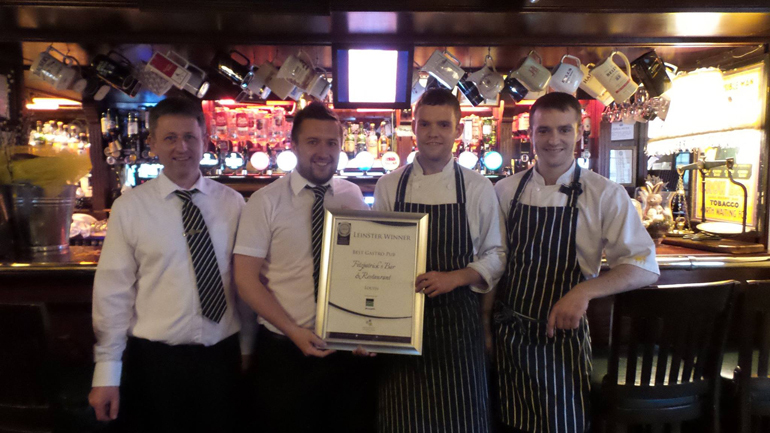 For the second year running, Fitzpatrick’s Bar and Restaurant have retained the award ‘Best Gastro Pub’ in Louth! The Leinster Regional Final of Irish Restaurant Awards took place in Clyde Court Hotel, Ballsbridge, Dublin on the 31st of March 2016 and named the top restaurants in the eleven counties for 2016. Over 500 restaurant owners and staff celebrated their hard work and achievements at the Awards, which saw many well-known restaurateurs of Leinster turn out to see if they had won one of the prestigious awards. Speaking at the awards night, Chief Executive of the Restaurants Association of Ireland, Adrian Cummins said; “The Irish Restaurant Awards celebrate their seventh-year this year and have become the Island’s biggest food awards. The credibility that these awards have is reflected in the amount of nominations they received this year. 30,000 nominations were cast across twelve categories showing that these are the awards that everyone wants to win.